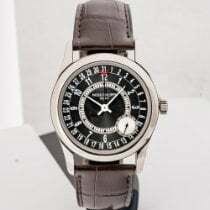 The Patek Philippe Calatrava is the flagship of this world-famous Genevan watch manufacturer and one of the most coveted dress watches on the market. Its design is classic and elegant, timeless and minimalist. It also makes a great investment. The Patek Philippe Calatrava is an icon of the watch industry. Few dress watches are as coveted and popular. Since its introduction in 1932, it has been the perfect companion for formal occasions – from the office to weddings to important business meetings. The understated design of the Calatrava was inspired by Bauhaus, a German school of design that still has a major influence on modern art movements. The watch's lines are clean and simple, its dial tidy and harmonious. While the Calatrava may be considered the quintessential classic wristwatch today, it was way ahead of its time back in the 1930s. It also has a longer history than most of the other watches on the market. That plus the prestige of the Patek Philippe brand makes the Calatrava a legendary watch and the dream of many watch lovers and collectors. How much does a Patek Philippe Calatrava cost? If you're looking for one of the most famous dress watches ever, the Patek Philippe Calatrava is the right watch for you. Enthusiasts and collectors of vintage watches are especially interested in the original model with the reference number 96 . It is characterized by its 31-mm case, indices, and dauphine hands. Considered small by today's standards, it is the ideal women's watch. Plan to spend around 10,100 USD for a pre-owned model. With any luck, you may even find this timepiece for under 7,000 USD. However, prices of over 23,300 USD are not unheard of. The Patek Philippe Calatrava ref. 5196 is the successor to the ref. 96. The current model is 37 mm in diameter and, thus, much more contemporary. At 7.68 mm thick, this Calatrava is pleasantly flat. It is available in platinum or rose, white, or yellow gold. The yellow gold edition costs about 18,700 USD new and 16,300 USD pre-owned, making it a sound investment. Rose gold pieces sit in a similar price range, while white gold watches are slightly more expensive. They sell for between 17,000 and 22,700 USD. The design of the Calatrava ref. 5196 in platinum features some unique elements, including Arabic numerals in place of indices and feuille (or leaf) hands. As a whole, this timepiece feels more classic and conservative. New examples of this platinum watch demand around 25,600 USD. Pre-owned pieces cost only slightly less. How much does the Calatrava with a guilloché bezel cost? The Calatrava with a guilloché bezel, Roman numerals, and leaf hands is also very famous and coveted. If you're interested in this timepiece, keep an eye out for the refs. 3919 and 5119. Both models have more traditional designs than those of the Bauhaus-inspired refs. 96 and 5196. Patek Philippe produced the 33-mm ref. 3919 from 1985 to 2006. Its successor, the 36-mm ref. 5119 with a similar design, premiered in 2006. 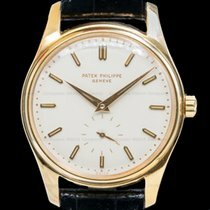 You can purchase a pre-owned Patek Philippe Calatrava ref. 3919 in yellow gold for just under 9,600 USD. Both the white and rose gold versions are a bit more expensive at around 11,000 USD. The current model (ref. 5119) is also available in white, rose, or yellow gold. The yellow gold edition costs 17,300 USD new and 14,800 USD pre-owned. The rose gold version is somewhat more expensive, with prices ranging from 16,200 USD pre-owned to 17,600 USD new. On the other hand, the white gold model is the most affordable. You can purchase a mint-condition timepiece for about 15,700 USD and a pre-owned one for around 13,400 USD. A traditional Patek Philippe Calatrava usually lacks a date display. Over time, however, there have been a few models that display the date at 3 o'clock. These include the reference numbers 5227, 5296, and 5153. The refs. 6000 and 6006 mark two exceptions, as they feature a pointer date. The white gold case of the current Calatrava ref. 6006 is 39 mm in diameter and only 8.86 mm thick despite having an automatic movement. These timepieces sell for around 26,000 USD new and 24,000 USD pre-owned. Its predecessor, the ref. 6000, is two millimeters smaller and costs about 20,700 USD in mint condition and 20,200 USD pre-owned. The rose gold variant changes hands for a few thousand dollars more. The Calatrava with the reference number 5296 is available in two designs: one based on the original from 1932 and the other with a sector dial resembling the Master Control Date from Jaeger-LeCoultre. Both variants are 38 mm in diameter and come in white or rose gold. The white gold edition demands about 22,000 USD in mint condition and 18,500 USD pre-owned. Prices for a new rose gold model sit around 24,300 USD. On the other hand, you can find pre-owned examples for less than 18,500 USD. The ref. 5227 also comes with a choice of yellow, rose, or white gold. The white gold version comes with a cream-colored or black dial. Both variants sell for similar prices: about 28,900 USD new. Pre-owned pieces change hands for some 4,000 USD less. The yellow and rose gold models cost around 27,500 USD in mint condition and a few thousand less pre-owned. The Patek Philippe Calatrava with the reference number 5153 sits in a similar price range. 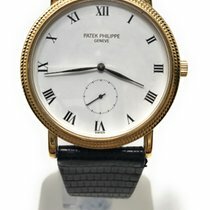 The collection has the cross fleury, Patek Philippe's company logo, to thank for its name. During the Middle Ages, this symbol was the emblem of the Order of Calatrava, which protected a castle of the same name in Castile. The Cross of Calatrava is also a part of the coat of arms of Jean-Adrien Philippe's home village; it can be assumed that this influenced the company's choice to use it as a logo. In 1887, Patek Philippe officially registered the Cross of Calatrava as their company logo. Today, the Calatrava can be viewed as the prototype for a round, elegant dress watch. Its shape plays an important role, as Patek's competitor Cartier had already released impressive, classy dress watches with rectangular cases, such as the Santos and the Tank. The cult watch Reverso from Jaeger-LeCoultre from 1931 is also rectangular. Patek Philippe considers the Calatrava to be the emblem of their company. The most popular version has reference number 3919 and was produced from 1985 to 2006. Its most distinctive feature is its guilloché bezel, known as a Clous de Paris bezel. Feuille (leaf) hands and Roman numerals emphasize the classic characteristics of this watch. With a diameter of 33.5 mm, the 3919 Calatrava was relatively small, at least according to today's standards. Its current version, the 5119, is a bit larger, at 36 mm in diameter. This is still considered relatively small in comparison to today's larger men's watches. The first Calatrava from 1932 had the reference number 96. Today, the current model can be found under reference number 5196. This version has not changed much from the original model. There is a small seconds at 6 o'clock, and the watch features dauphine hands and line indices. Curiously, both of these watches seem as if they were made in the 1950s. The 96, with its Bauhaus-inspired, stripped-down look, was forward-looking at the time, while the 5196 attempts to recreate the origins of the series. Although Patek Philippe has masterfully conquered the art of watchmaking like almost no other manufacturer, the Calatrava remains a simple series. The company's leading collection has no chronographs, perpetual calendars, moon phase displays, minute repeaters, tourbillons, or any other extras. The dial on the popular 5119 model does not feature a date display, giving the watch a harmonious, symmetrical look. The 5196 simply has hour and minute hands and a small seconds. Both the 5119 and the 5196 are powered by the manual caliber 215 PS . It vibrates at 28,800 A/h and has a 48-hour power reserve. The 5120 is powered by the automatic caliber 240 and was kept as simple as possible, foregoing even a second hand. The Calatrava 6000 has a pointer date display, with the numbers 1-31 running around the edge of the dial. The automatic movement 240 PS C makes this layout possible. Other versions of the Calatrava display the date in a more traditional way: in a window at 3 o'clock. For these watches, Patek Philippe uses the automatic movement 324 SC. 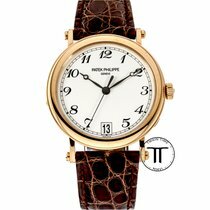 Patek Philippe has existed under this name since 1851. The Polish watchmaker Antoni Patek (1811-1877) began working together with his French colleague Adrien Philippe (1815-1894) in Geneva, Switzerland in 1845. Philippe had invented the crown mechanism for winding and setting pocket watches in 1844. Up until that point, watch movements could only be wound via keys. In 1851, Patek and Philippe traveled to the Great Exhibition in London and gained Queen Victoria, who bought two watches, as a prominent customer. The royal houses of Denmark and Italy also joined their clientele. The New York jeweler Tiffany & Co. ordered 130 watches. The first wristwatch from Patek Philippe was created in 1868, and they received a patent for the first double chronograph in 1902. In 1925, they introduced the first wristwatch with a perpetual calendar. The Stern family bought the company in 1932. Thierry Stern has been leading the company since 2009. Every year, Patek Philippe produces around 50,000 watches.